The responses were awesome and overwhelming. You all gave me some of the most creative and delicious pancake flavors— I can’t wait to share recipes for them all. Seriously, we could put IHOP outta business. But the most overwhelming favorite– mostly because of the rich flavor and fluffy texture— were ricotta pancakes. And you know? I had actually never made them. The best ricotta brainstorm of that day came from a back and forth conversation with a fan (and help me here, ya’ll– I can’t find those messages on my Facebook timeline anywhere, so if it was you then speak up so I can give credit where credit is TOTALLY due! 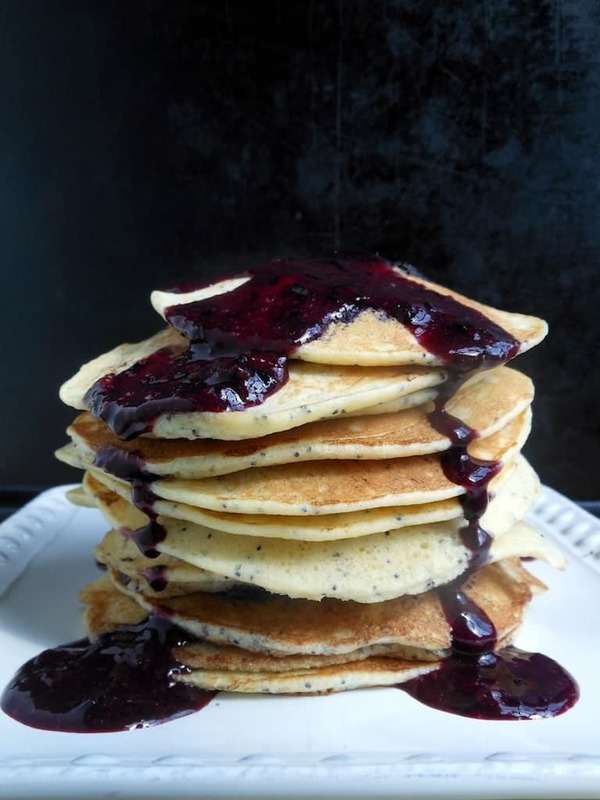 ), and we ended up with this: Lemon Blueberry Poppy Seed Ricotta Pancakes. Then I added this super easy blueberry syrup. These pancakes were SO amazing and delicious… they were pretty much out-of-control. They made me feel just a teensy bit fancy and the best part was THEY WERE SO SIMPLE!! The biggest difference between these and traditional pancakes was the separated eggs. Beating the egg whites and folding them in made the texture so light and airy! These are hands down MY FAVORITE pancakes to date. And that includes the man-cakes I made all full of bacon and bourbon. Go figure. 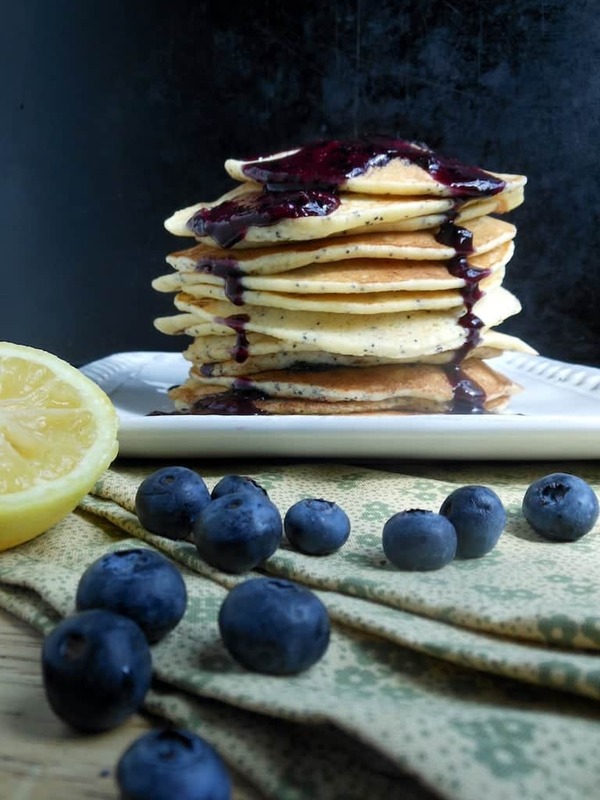 Blueberries are in season and just like with muffins, the lemons and poppy seeds make these blueberry pancakes POP. The moral of this story is: We need to collaborate more often. You all are super!!! I heart you. Heat a large skillet or pancake griddle to medium high. Place the ricotta in a fine-mesh strainer to drain any excess liquid. In a large bowl beat the milk, egg YOLKS, ricotta cheese, and lemon zest. Add the flour, baking powder, sugar, and salt and whisk until combined. Stir in the blueberries and poppy seeds. Beat the egg whites with a hand mixer until they are stiff and frothy-- 2-3 minutes. Butter the hot skillet or griddle. Using about ¼ cup measure, dip the pancake batter onto the hot buttered cook surface. While you wait for the pancakes to cook, add all the Blueberry Syrup ingredients to a small saucepan, stir, and bring it to a simmer. Let it cook down and thicken, stirring occasionally. Flip the pancakes when bubbles appear and pop on the exposed surface. Cook for a little over a minute on the second side and remove to a plate. Repeat with the remaining batter. When the blueberries have cooked down and are thick and sticky, scrape the mixture into a blender and puree. This makes a smooth pour-able syrup. 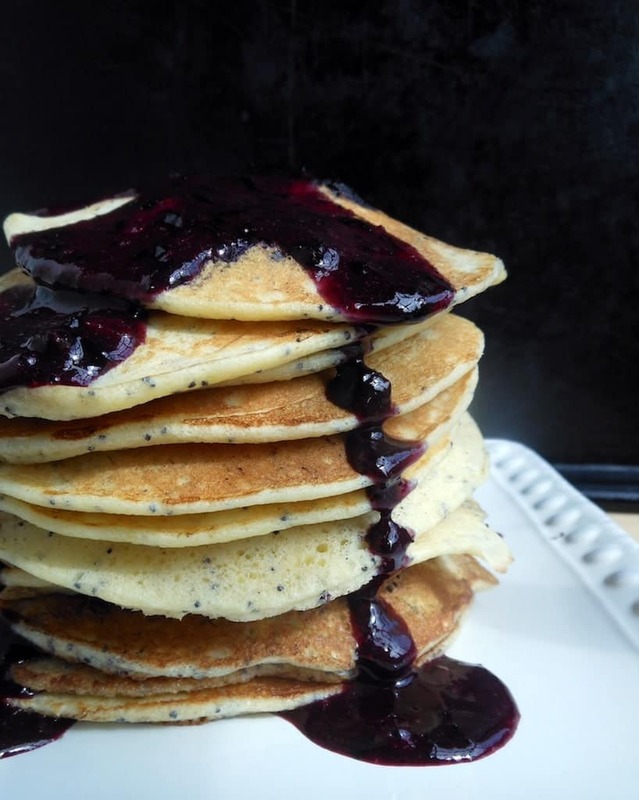 Pour the warm blueberry syrup over the pancakes and serve. The ricotta pancake base was just slightly adapted from the Fluffy Ricotta Pancake Recipe found at The Kitchn. I shuffled things around a bit, making this a mostly one-bowl recipe (besides the bowl you’ll need to beat the egg whites). It worked. These look delicious, Heather! 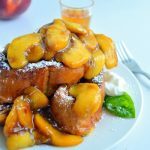 I’ve never used ricotta in pancakes, but it sounds delish! 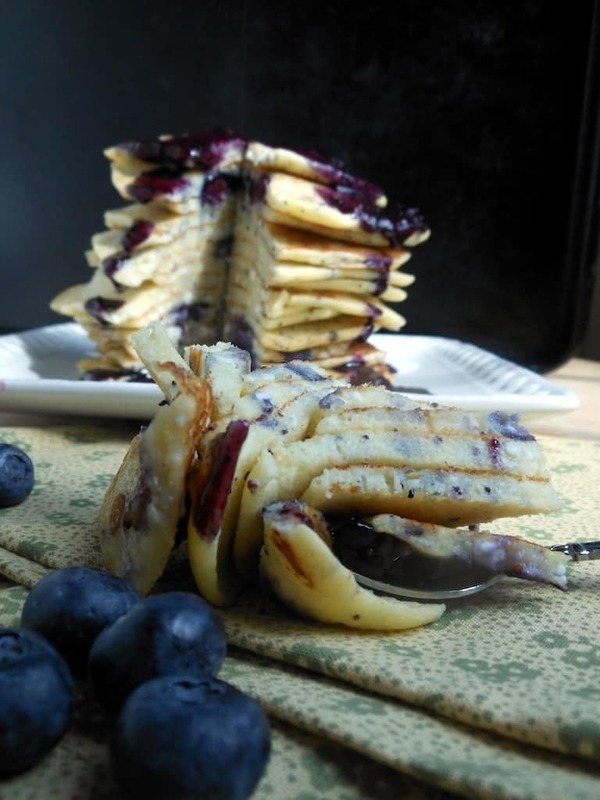 Love the blueberry syrup idea, too–yum!!! So so many people were into the ricotta pancakes! I had to give ’em a go. They are super yum. 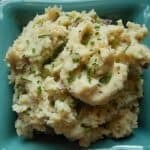 Do you think I could substitute mascarpone cheese for the ricotta? Hey Deanna! You could certainly try! That sounds delicious! The trick is to FOLD the cheese in — it makes the pancakes very light. Since mascarpone is much heavier than ricotta, you may want to whip it (with a whisk attachment on a hand or stand mixer) first so it is fluffy. Then fold it in. And please let me know how it turns out for you! Mascarpone is SO good!! These look so delicious!! Love a good pancake!! These look so good! I want to drink that syrup! Wow! Now thats a stack of pancakes!!! I love that you added the poppy seeds, and yes the blueberry does pop! 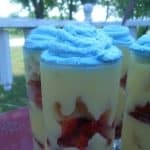 I may have to make these TODAY!!! Blueberries have been so sweet lately and I need to use some up! Thanks, Tanya!!! I hope you’ll try them– let me know! If nothing else make the syrup and pour it on ice cream. Ohhh man it’s good. HEATHER WHAT THE HECK. I want a stack twice the size of your amazing stack so I can bury my face in it. Hell yuusssss. Haha. I’ll trade you pancakes for DONUTS. Let’s get that on a calendar somewhere please. Your pictures CRACK me up lol And btw you’re really getting artsy I love it!!! But that one pic where you cut through all those pancakes haha worlds biggest bite!!! Made me feel like I was watching some silly disney movie haha Warm and fuzzy inside!! BTW I love the flavor combinations….FOOD STAR!!!! Check your email!! P.S. I took that bite. Oh my. These look more delicious than anything I’ve ever seen on your blog before. I love lemon poppy seed muffins so I’m sure I’d be all over these! Thanks, Ameena! What a nice compliment! I love lemon poppy seed muffins, too! 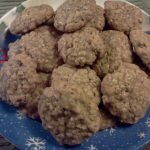 I just made these, and they’re yummy! However, mine did NOT look anything like yours. Did you puree the blueberries into the batter? Mine were rather lumpy and, of course, had whole blueberries in them. Either way, though, they tasted delicious! Hi, Lynn! I’m so glad you tried these!! 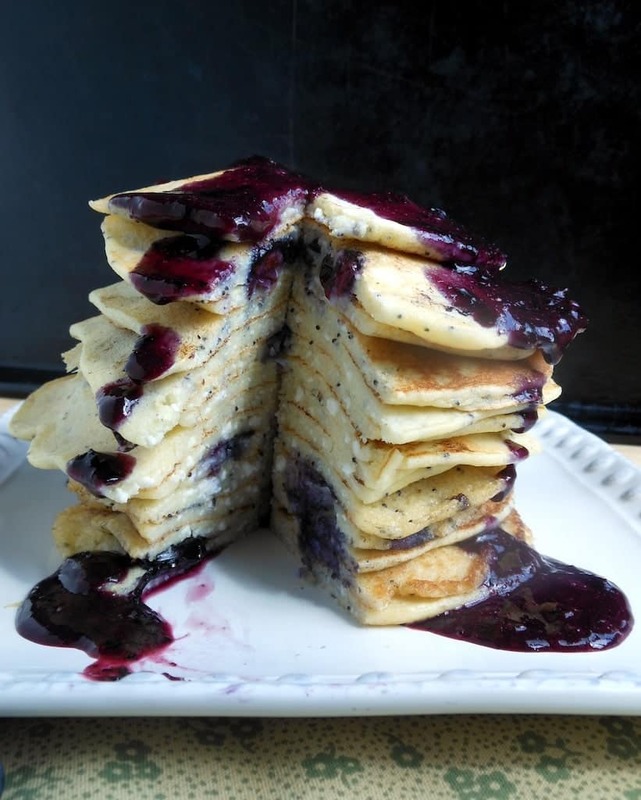 I used whole blueberries as well– I think my blueberries all ended up sort of towards the middle of my pancakes (if you’ll look at the photo with the slice cut out you’ll see they are all kind of in the center) which may be part of it and honestly that wasn’t intentional on my part. I use a 1/4 cup dry measuring cup to dip out my pancake batter. Two things that may contribute to having fluffier ricotta pancakes: 1. make sure the ricotta is WELL drained. I set mine in a fine mesh strainer over the sink while I beat the egg whites just to be sure all the excess liquid is out, and 2. REALLY beat the egg whites and then CAREFULLY fold them in. The egg whites will give your pancakes more lift. I hope this helps and I’m thrilled you liked them!! !